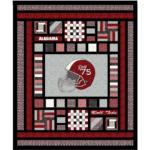 Home / Applique / Are You Ready for Some Football? Are you ready for some football? If you love football as much as I do, you ARE ready! A chill in the air (unless you live in Florida! ), cheerleaders, drill teams and school bands…and NFL Fantasy Football! I love it all – getting together with friends to watch the games, nibbling on delicious snacks, and maybe sipping on a frosty beverage. There’s just nothing like it! I’ve pinned a bunch of yummy appetizers, drink recipes, and games on my Football Ready Pinterest board. Check it out! 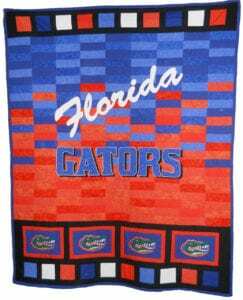 IF you’re looking for a great way to show your team spirit year round, create a quilt to keep you warm and decorate your space. The right quilt makes a colorful graphic addition to any room. Throw it on the bed or hang it on the wall! 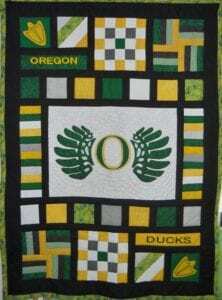 Team Spirit was designed as a Christmas gift for a young Oregon Ducks fan. It’s a fun, flexible quilt design. It’s modern and bright, works for guys and girls, and it’s a lot of fun to make! Customize it for your school, team, or sport. The instruction book is easy to follow, and practically guarantees success! Customize the football helmet with your favorite athlete or fan’s name and team colors. You might even add their jersey number or graduation year! 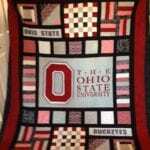 A Team Spirit quilt makes a wonderful gift for birthdays and graduations. College kids love it as dorm room decor too! Are your team colors red, white and grey? Check out School Spirit. 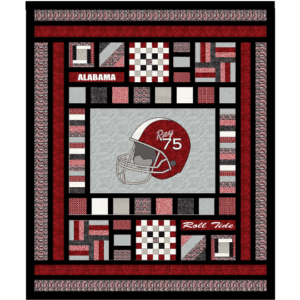 It’s the same pattern as Team Spirit, tailored for schools whose colors are red, white & grey. 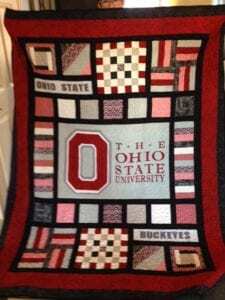 The quilt at left was made by an Ohio State fan, using the School Spirit pattern. The center panel pattern is not included in the pattern download. I developed an easy, step-by-step applique tutorial you can use to create your own pattern for the center panel (or any other project!). 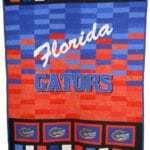 Go Team was designed for my niece, an alumni of University of Florida. This design combines a gradient center panel made up of is modern, bright, bold, and fun. What a great way to celebrate your school and team spirit! It can be customized for any school, team, or sport. Go Team is another truly flexible pattern design. Use the four motif/logo blocks to display mascots, logos, etc. Follow my easy tutorial to create your applique patterns, or create your block designs using embroidery software. Cheer Squad is a queen-sized version of the original Team Spirit design. I enlarged the main section of the original design to keep the Team Spirit feeling. A few borders in coordinating print fabrics have been added to bring the quilt to a generous queen size. Due to licensing restrictions, patterns do NOT include team-specific or school-specific patterns. Use the patterns provided, or follow the Easy Applique Tutorial to create your own patterns. Create patterns from schools and sports teams to superheros and princesses. I’ve got you covered. 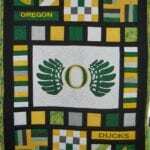 If you’re an Oregon Ducks fan, pick up my FREE applique pattern HERE. It’s a perfect fit in the Team Spirit center panel. Show your team or school how much you care. Create your quilt today!